And yet, dear Kit, the kitchen you were photographed canning tomatoes in with all of its incredibly realistic looking accessories would put a parent back over $230.00 if they wanted to recreate your sense of thrifty resourcefulness for their own child. 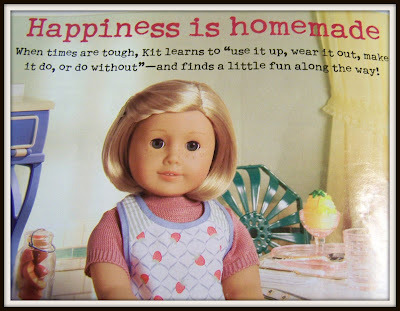 I think I'll give my daughters, and the American Girl Dolls they will eventually bring home, a more authentic taste of frugality by having them hang out in our own life size un-airconditioned kitchen with the peeling floor tiles and mismatched silverware. Because, yes, in even in "beautiful, perfect, wonderful" America, excess equals mass dissatisfaction. It is all of the things we don't need to have which give us freedom to pursue contentment independent of our material circumstances. Please remind me of this if you ever see me drooling inside of a Pottery Barn. Just un-pry my fingers from the velvety crimson love seat and point me firmly in the direction of my friends, my full refrigerator, and loving family. We felt the same way about these dolls. But Grandma, who purchased them, decided that Mary Kate needed hers early and so last year on her 5th she received, you guessed it...Kit! MK plays very well with her. Hannah is excited to be near NYC because the store is there with a complete salon...can you imagine? I'm trying not to! I found an inexpensive "wanna-be" catalog that sells the furniture and clothing at 75% less than AG. Actually, the girls use their old baby clothes and thank God Gramma sews little doll dresses. I'd take your kitchen anyday, just as long as we can share a laugh, some stimulating conversation and a great cup of tea or a glass of wine should we talk-talk-talk into the evening! BTW, I won't except your book unless it is hand delivered! Most assuredly, my prayers are with you. Oh yes, the salon. I believe that Chicago has one to. I remember when I was in college seeing a limousine pull up to the AG store entrance carrying little girls clutching identically dressed dolls and even then, I was dumbfounded. You are welcome any time, I am a horrible cook but I make a mean cup of coffee! Thank you for your prayers, they are most appreciated!